With less than one week now remaining until the launch of SpaceX’s second operational International Space Station (ISS) resupply mission, preparations to make the orbital outpost ready to receive the Dragon capsule are progressing smoothly. However, resupply flights for the remainder of the year continue to be re-shuffled around a packed and challenging logistics flight manifest. The upcoming SpaceX Dragon mission will be the third Dragon flight to the ISS, but only the second operational cargo delivery by SpaceX under the Commercial Resupply Services (CRS) contract. 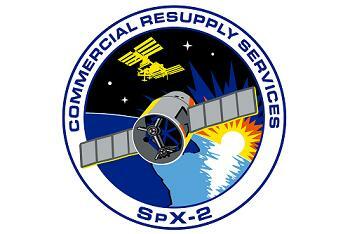 Commonly known as CRS-2, the mission is designated as SpX-2 within the ISS program, as detailed on a NASA patch for the mission. The SpX-2 mission is currently targeting a launch on Friday March 1 at around 3:10 PM GMT, or 10:10 AM local time at the Cape Canaveral Air Force Station (CCAFS) in Florida, making for the first daylight launch of a Dragon spacecraft to the ISS – hopefully without further “tantrums” from any of the Falcon 9’s first stage Merlin 1C engines, although this mission will be the last flight before the new Falcon 9 v1.1 comes into service featuring improved Merlin 1D engines. 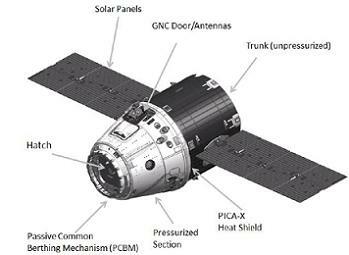 The following day, Saturday March 2 – only one day after launch instead of the two days on the SpX-1 flight – Dragon will rendezvous with the ISS using what are now proven procedures, and be captured by the station’s robotic arm for a berthing to the Node 2 Nadir Common Berthing Mechanism (CBM) port, whereupon hatches will be opened and cargo transfers will begin. Dragon will carry a total of 677 kilograms/1,493 pounds of cargo to the ISS, of which 102kg/225lb will be packaging materials. Just over half of the cargo (348kg/767lb) will be devoted to experiments for NASA and the European, Japanese, and Canadian space agencies – making around 51 per cent of the total cargo devoted to experiments, which is in line with the previously stated goal that half of the cargo on CRS fights will be devoted to science. Two GLACIER science freezers will launch on SpX-2, one of them active (powered) and the other passive (unpowered). The rest of the cargo on the SpX-2 Dragon will be devoted to crew provisions (food/clothing/hygiene items), and both new & spare hardware for the ISS and its systems. 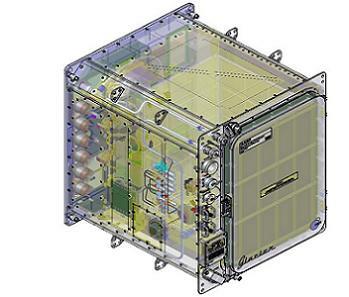 Some of the larger spare parts launching on SpX-2 include an Electronics Unit (EU) for a Minus Eighty-degree Laboratory Freezer for ISS (MELFI), and a Carbon Dioxide Removal Assembly (CDRA) bed. 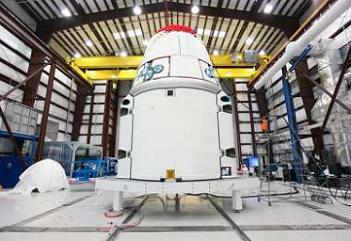 The SpX-2 Dragon will mark the first time that a Dragon has carried external cargo to the station inside its Trunk, which in this case will be two Heat Rejection Subsystem Grapple Fixtures (HRSGFs), which are essentially bars each featuring two Flight Releasable Grapple Fixtures (FRGFs). These “grapple bars” will be used to aid in handling of ISS radiators in a repair or replacement scenario, by adding grapple fixtures to the radiators for the station’s arm to interface with. The HRSGFs will be removed from Dragon’s Trunk robotically, either with the Space Station Remote Manipulator System (SSRMS) or the Special Purpose Dextrous Manipulator (SPDM) “Dextre”. Once removed, they will be installed onto the Payload ORU Accommodation (POA) on the Mobile Base System (MBS) on the ISS Truss, where they will each await respective installation onto the S1 and P1 Truss radiators during a US spacewalk in the June/July timeframe. Once all the internal and external cargo has been unloaded from Dragon and stowed on the ISS, Dragon will then be loaded with cargo to be returned to Earth – which will total at 1,370kg/3,020lb, of which 160kg/352lb will be packaging – meaning that the SpX-2 Dragon will return over double the amount of cargo to Earth than it launches to the ISS. The return cargo devoted to experiments will total in at 660kg/1,455lb, making for around 48 per cent of return cargo devoted to science, again in accordance with the promised roughly 50/50 split for scientific and other cargo. One GLACIER freezer will return as part of the scientific cargo, containing samples stored up on the ISS since the previous return of a Dragon spacecraft back on October 28 last year – during which the GLACIER freezer lost power after splashdown due to seawater intrusion into the Dragon. The rest of the cargo returning on Dragon will be devoted to excessed or failed equipment, comprising many failed Environmental Control and Life Support System (ECLSS) components including an Oxygen Generation System (OGS) Hydrogen Sensor ORU (Orbital Replacement Unit), a Pump Separator ORU, and a CDRA bed. Once the return cargo has been loaded, Dragon’s hatch will be sealed up, and Dragon will then be unberthed from the ISS for a de-orbit burn, re-entry and splashdown into the Pacific ocean a short time later, currently planned for Monday March 25. That will conclude the SpX-2 mission, and hopefully rack up another successful flight in SpaceX’s now swiftly progressing mission log. As a preparation activity prior to the launch, SpaceX successfully conducted a static test fire of the Falcon 9 on Monday, with this test being unique in that both it and the Wet Dress Rehearsal (WDR) – which were both previously conducted separately – were rolled into one event in order to improve efficiency as SpaceX become more confident with their hardware and procedures. While SpaceX have been hard at work preparing for the upcoming mission on the ground, the ISS has also been making preparations of its own, as detailed in exclusive and extensive ISS on-orbit status notes available on L2. According to the notes, last week the SSRMS was “walked off” from the MBS Power & Data Grapple Fixture-1 (PDGF-1) to the Node 2 PDGF, in order to position it correctly to allow it to grapple Dragon when it arrives below the ISS. Following this, the ISS crew, consisting of Commander Kevin Ford and Flight Engineers Chris Hadfield & Tom Marshburn, conducted “offset” grapple practice using the SSRMS controlled from the Cupola Robotics Workstation (RWS), and a Flight Releasable Grapple Fixture (FRGF) on the Permanent Multipurpose Module (PMM). The purpose is to deliberately offset the SSRMS Latching End Effector (LEE) at an angle from the PMM FRGF, in order to allow the crew to practice making misaligned approaches to grapple fixtures, in order to better prepare them for such an eventuality occurring during the capture of the Dragon. The ISS crew were also hard at work conducting a major on-board software upgrade this past week, which didn’t go entirely to plan as it resulted in the US segment of the ISS losing communications with the ground for three hours, with the only communication capability remaining during this time being via the Russian Segment (RS) Very High Frequency (VHF) link, when it made passes over Russian Ground Site (RGS) stations. 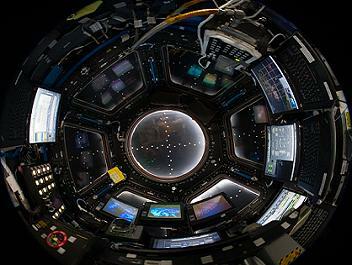 The software upgrade, known as X2_R12, was the latest in the series of annual major software upgrades aboard the ISS that includes many updates for various systems all rolled together into a single package. The last major upgrade, X2_R11, was performed in November 2011. According to L2 notes, the upgrade was first applied to the Command & Control (C&C)-1 and 3 computers, which were in backup and standby modes respectively, while the active C&C-2 continued to run the older X2_R11 software. The plan was then to transition the upgraded C&C-1 to primary so that C&C-2 could itself be upgraded. However, upon initiation of that plan C&C-1 instead transitioned to diagnostics mode due to an “Ada Exception” (Ada being a programming language common in aerospace systems), later isolated to the “Visiting Vehicle Checkpoint consumption” – essentially meaning that C&C-1 tried to get data for a visiting vehicle that wasn’t present. 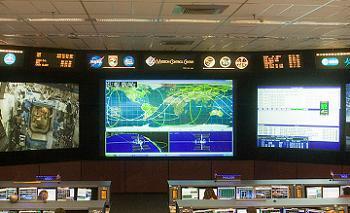 The exception led to a complete loss of comm between the US Segment and Mission Control in Houston, although Houston was eventually able to contact the crew via Russian comms and send them steps to re-enable US Segment S-band comms. According to the notes, C&C-1 was then recovered by reinitializing it, following which the Visiting Vehicle Checkpoint consumption was inhibited. In the following days, C&C-2 was successfully loaded with X2_R12, meaning all the C&C computers are now ready to receive Dragon. Also of relevance to the SpX-2 mission in the L2 notes is the fact that the Space Integrated GPS Inertial Navigation System-1 (SIGI-1) locked up on February 18, requiring two power cycles to recover it. The notes stated that “SIGI lockups are considered nominal and are typically attributed to a Single Event Upset (SEU) due to radiation”. 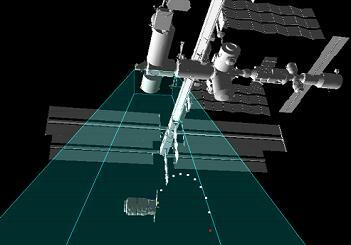 There are two SIGIs on the ISS, both of which are required to be operational in order for Dragon to perform Relative GPS (RGPS) navigation with the ISS. While SpaceX are preparing to make their third flight to the ISS, Orbital Sciences Corporation are also hard at work preparing for the debut mission of their Antares rocket and Cygnus spacecraft to the ISS. With the first milestone in the Antares and Cygnus test program now complete – a 30 second hold-down test of the Antares first stage – which appears at first glance to have been a complete success, the next milestone will be a full-up test flight of the Antares rocket with a dummy Cygnus spacecraft. According to Orbital officials, this milestone is scheduled to be performed around 5 weeks after the hold-down test, which would give a tentative date of early April for the Antares test flight. The COTS demo flight – where the first Cygnus spacecraft would attempt to rendezvous and berth with the ISS – would be performed around 3 months after the Antares test flight, giving a tentative date of early July for the COTS demo flight. Finally, the first Antares/Cygnus CRS flight would occur 3-4 months after the COTS demo flight, giving a tentative timeframe of early October-early November for the first Orbital CRS flight – although November has issues from a flight scheduling standpoint, due to a Beta angle cut-out from Nov 2 to Nov 9, and then a period where only one US crewmember will be present on the ISS (thus creating issues for Visiting Vehicle captures) from Nov 10 to Nov 25. The above schedule however is extremely tentative, and is dependent upon the test flight program proceeding without any issues or setbacks. Other ISS resupply vehicle flights have been undergoing schedule changes recently, with NASASpaceflight.com receiving word via L2 sources that the flight of ESA’s Automated Transfer Vehicle-4 (ATV-4) has been delayed from its previously planned date of May 7 to a new date of No Earlier Than (NET) June 7, due to the need to replace a failed electrical unit aboard ATV-4. Additionally, Japan’s H-II Transfer Vehivle-4 (HTV-4) could also now be looking at a launch date of August 4, instead of its previously planned date of July 20, although this delay has yet to be confirmed. 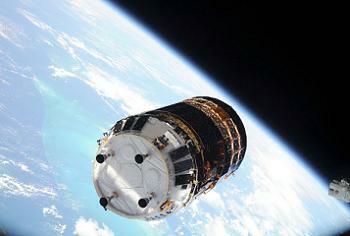 The reason for the possible slip in the HTV-4 launch date is not known at this time. HTV-4 will carry three external payloads to the ISS – a spare Main Bus Switching Unit (MBSU), a spare Umbilical Transfer Assembly (UTA), and the Space Test Program-Houston 4 (STP-H4) experiment, which all recently left the Kennedy Space Center (KSC) Space Station Processing Facility (SSPF) bound for their Japanese launch site. HTV-4 will also dispose of the older STP-H3 experiment when the vehicle burns up for a destructive re-entry. The Russians also recently changed their manifest of ISS resupply flights for the rest of 2013, as all Progress (and Soyuz) flights for the rest of this year will now be of the fast-rendezvous type, meaning a docking to the ISS will occur only six hours after launch. However, the Progress M-21M flight in November will be of the traditional two day rendezvous type, as that particular Progress will be used for another test of the new Kurs-NA system that was first tested on Progress M-15M in July last year. Only one other SpaceX flight is planned for 2013 after the SpX-2 mission, with SpX-3 scheduled to fly on October 2 and return to Earth on November 1 – a flight that could potentially cause conflict with Orbital’s first CRS mission should it fly in that timeframe. 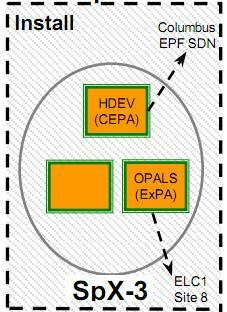 L2 documentation shows that the SpX-3 flight will carry two external payloads in its Trunk – the High Definition Earth Viewing (HDEV) and Optical PAyload for Lasercomm Science (OPALS). The previously planned Nitrous Oxide Fuel Blend eXperiment (NOFBX) payload has been removed from the SpX-3 flight and has yet to be re-manifested. The next SpaceX flight after that, SpX-4, will not occur until January 2014, carrying the recently announced RapidScat payload in its Trunk. With five different resupply vehicles from all over the globe now trying to find space in the ISS flight manifest, scheduling challenges will not be uncommon in the future, as the era of post-Shuttle resupply kicks in so as to fully support the ISS in its mission of science and discovery. (Images: via L2’s SpaceX Dragon Mission Special Section – Containing presentations, videos, images (Over 2,500MB in size), space industry member discussion and more. Now includes CRS-1 Image Dump, every single hi res photo taken from the ISS – 350 Hi Res images).